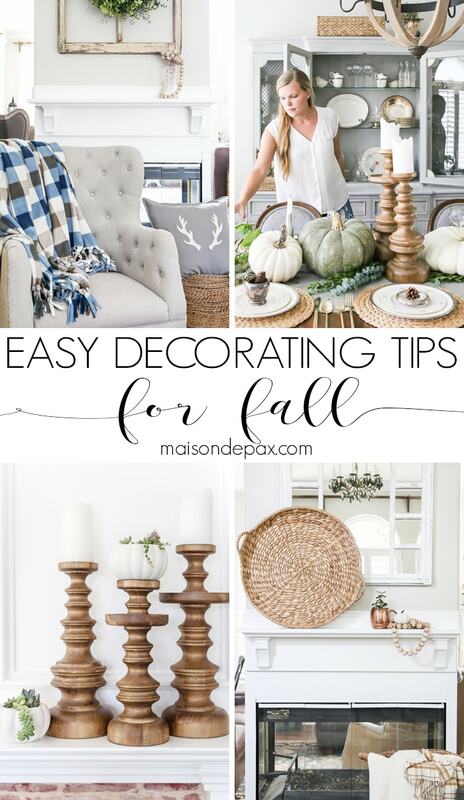 Looking for easy fall decorating ideas? 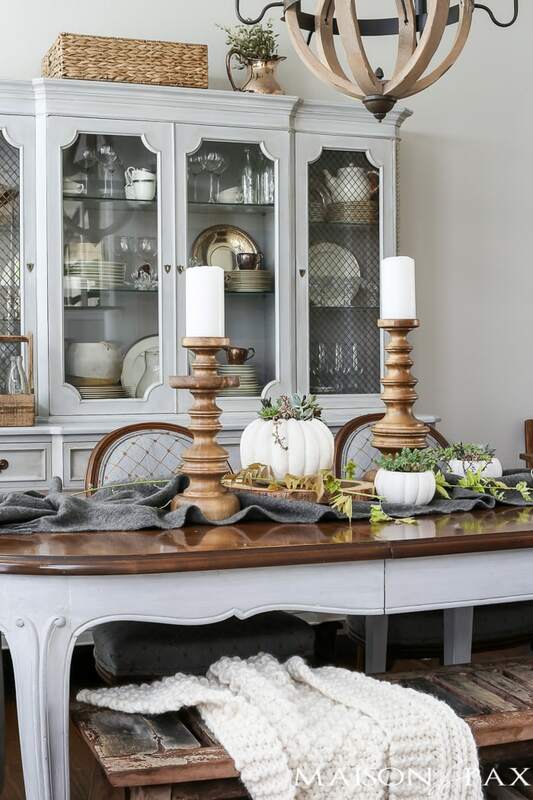 These simple fall decorating tips will make it easy to create a cozy, inviting look for fall. The older I get, the more convinced I am that seasonal decorating ought to be a celebration, not a chore. 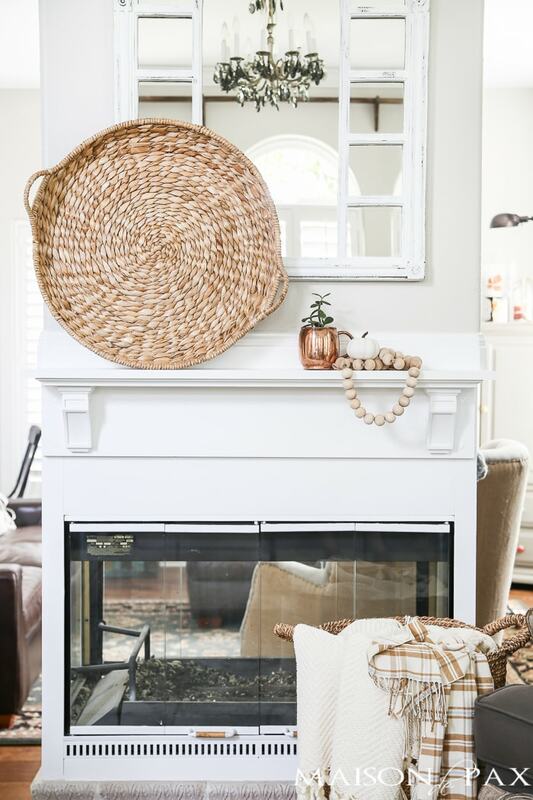 I want my home to be a place that encourages my kids to see the beauty of the season, that welcomes my guests to relax and smile, and that allows me and my husband to rest in whatever season life – or the weather – has called us to. In other words, it should be simple and fun. 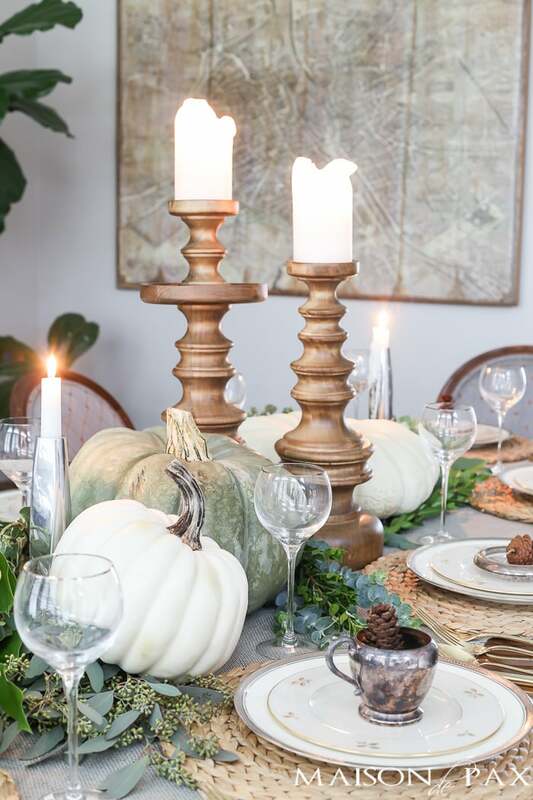 And with that in mind, I’m excited to share my go-to fall decorating tips as part of a fun fall tour organized by my friends Jennifer of Decor Gold Designs and Randi at Randi Garrett Design. If you’re dropping by from Randi’s blog, welcome! Be sure to check out the next stop on the tour at the bottom of the post. 1. Don’t limit yourself to traditional fall colors. 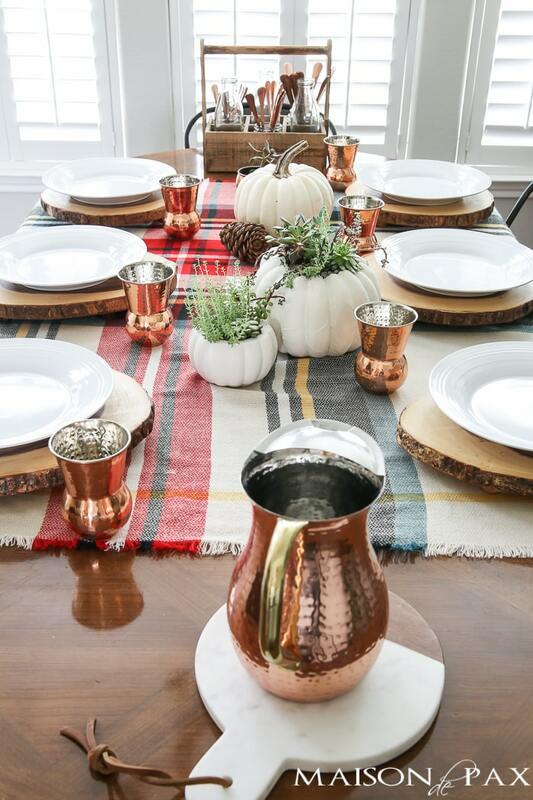 Or you can create your own color palette with your favorite pattern (like this fun rustic and copper spread I did last year). 2. Use lots and lots of texture. 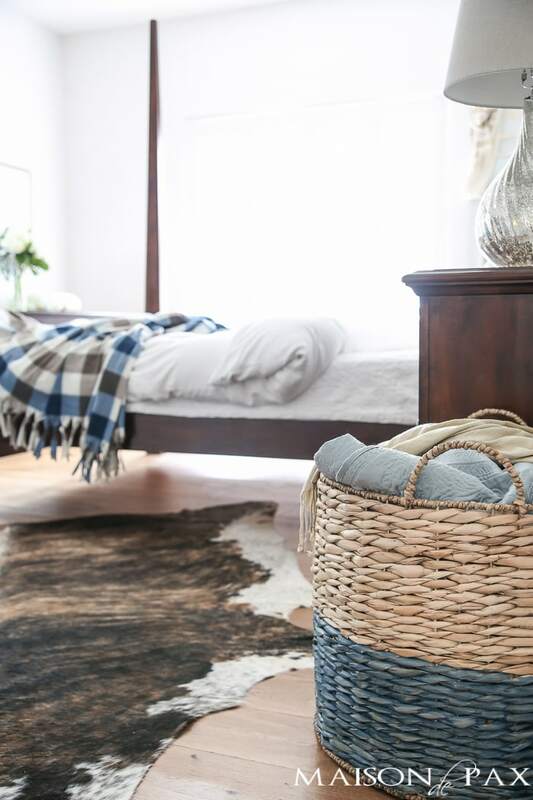 With woven baskets and knit blankets, you can give your home a sweet, cozy feel. 3. Bring in fall foliage. It doesn’t take much. 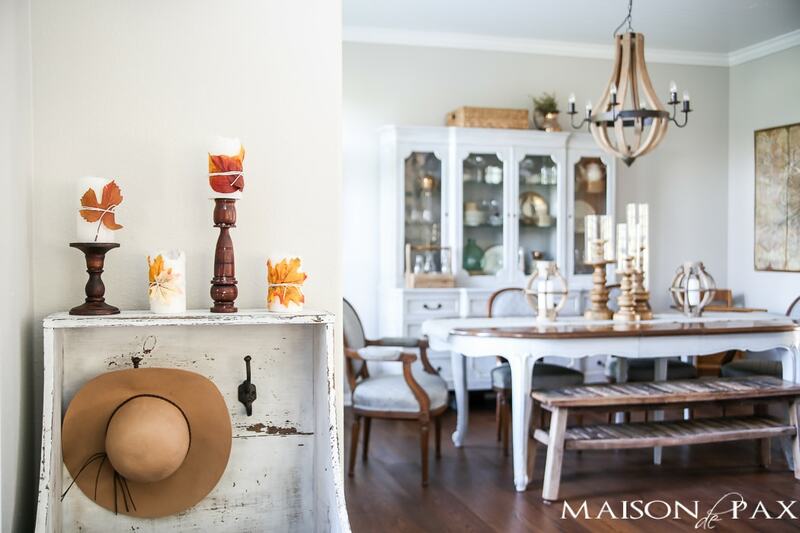 Just one gorgeous clipped branch can transform a whole space into a fall retreat. Whether it’s real or faux, fall foliage is a simple way to celebrate the season. And as a bonus, you can download that fall printable you see there for free. 4. Use clothing accessories as decor. And a hat well placed is always charming. 5. When in doubt, add a throw. Or view some of my favorites I shared last winter. How can you say no to something that encourages sweet snuggles in your home? 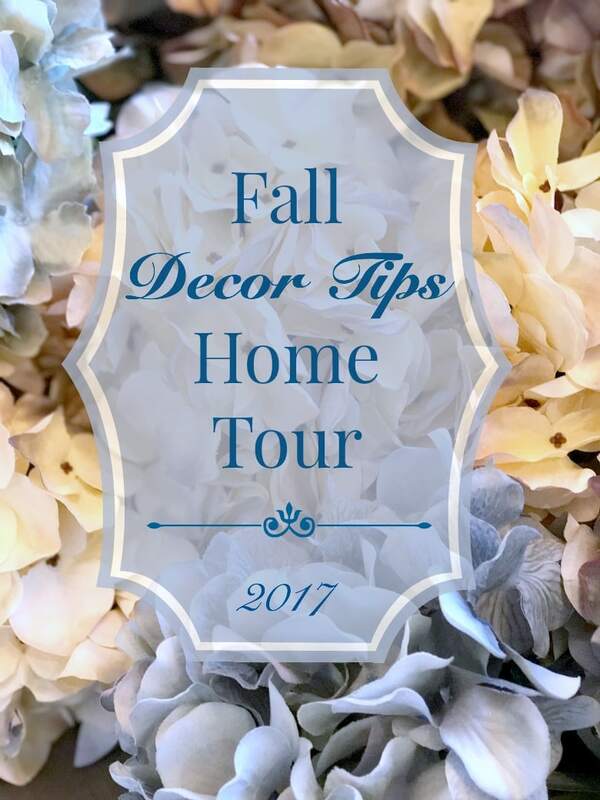 Now for more tips for decorating for fall, you can continue the tour at sweet Jennifer’s blog, Dimples and Tangles. Or visit any of the talented bloggers linked below. Rachel, I just want to sit down and take this all in, and then join you on that beautiful patio for dinner! 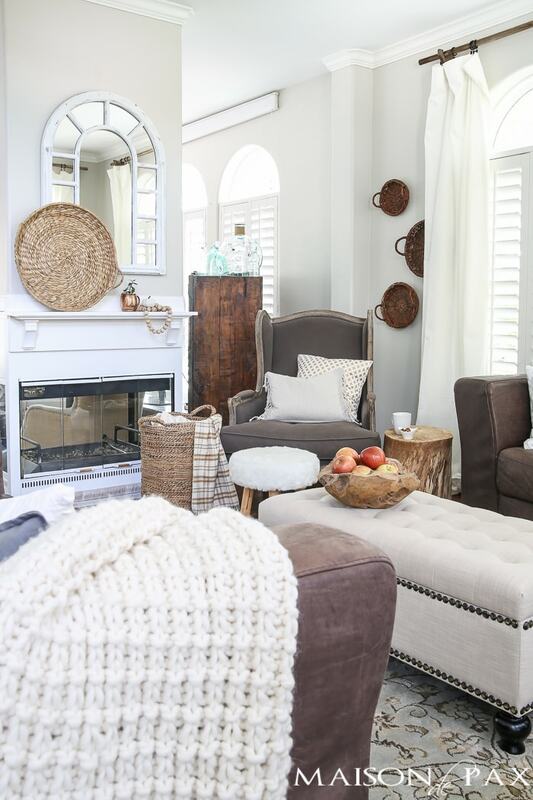 Your home is so cozy and welcoming for Fall. Beautiful! Thank you Lory! 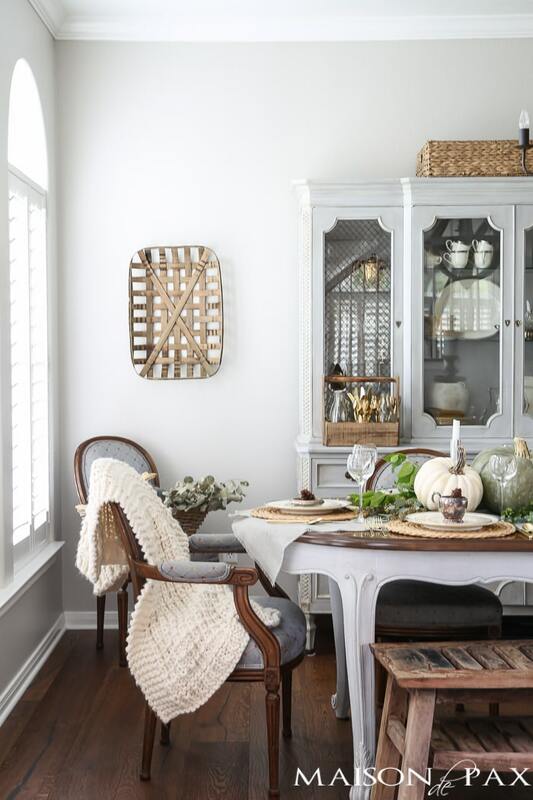 Fall decor is almost effortless! Perfect tips! I always love to add an extra throw (or twenty) for fall, especially outside. 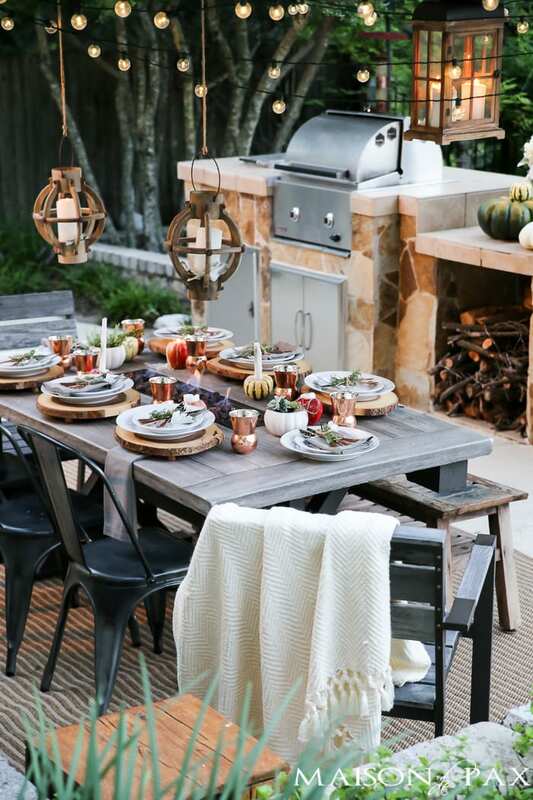 Your outdoor dining with that tablescape is so fabulous! It makes me excited for cooler evenings! Rachel what fabulous ideas!!! 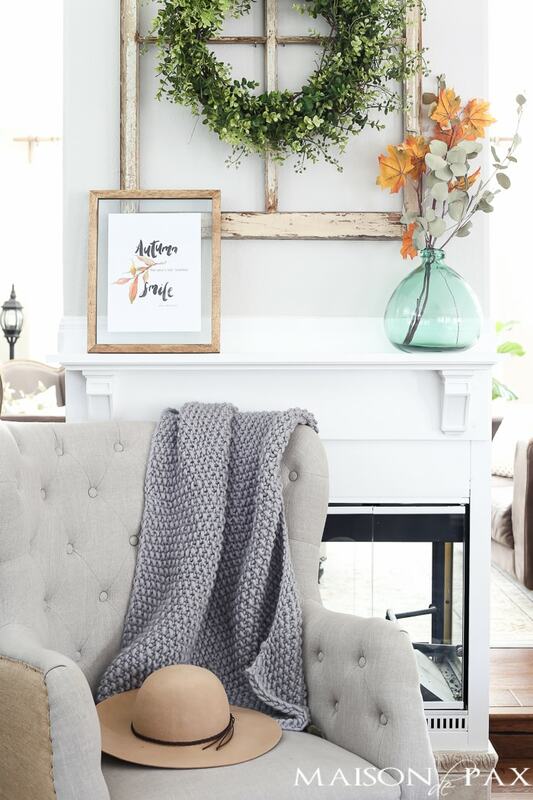 I love how you style your home to make it feel so cozy for fall! I’d love to see it in person someday! Happy fall my friend! Absolutely! Thank you so much, Norma. Rachel I just love your beautiful home! I especially loved your tip about throws! Gorgeous as always sweet friend, xo! I so enjoy your beautiful home in every season…you create such a warm and cozy environment for your family…your home feels as if there is a huge blanket wrapping around it. 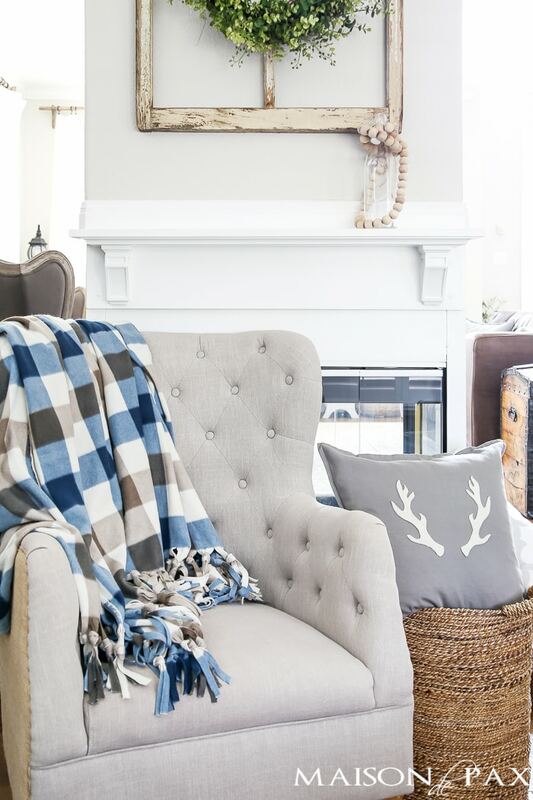 I love your home you have done a great job making cozy for Fall. Hope your family and friends are doing well and have places to live. 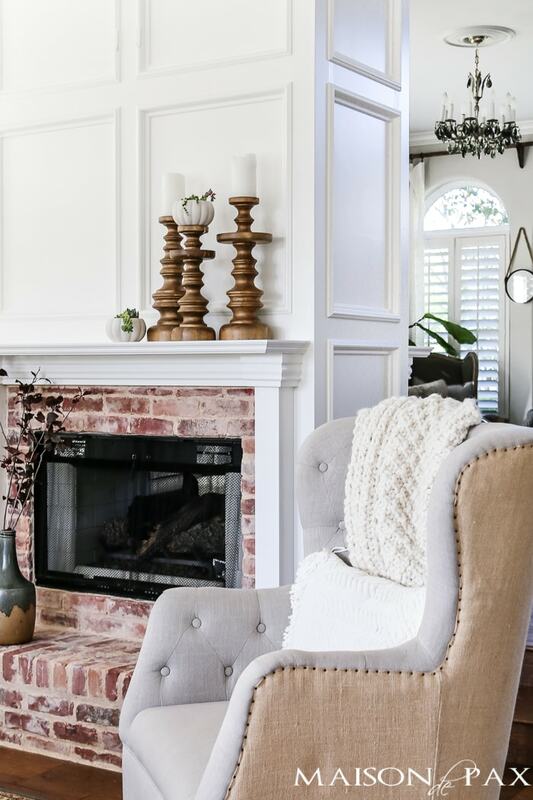 Those candlesticks are beautiful and that chair by the fireplace is gorgeous. Any info on where to get them? You already have a new dan and follower! Your spaces are gorgeous!! Love your ideas 🙂 adding to my copper and woven basket collection this fall! Perfect! Glad it inspired you! 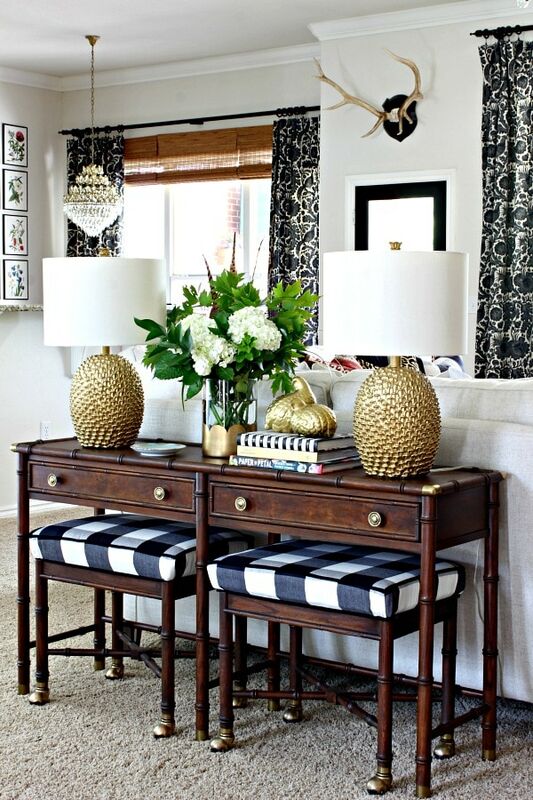 The last pic shows stools with large black and white cushions. I have notice this large check in black and white quiet a few times recently. Love it. I love the cozy throw! I will be making one asap, so easy and pretty!